El noggin’ – apparently humans can’t resist a soft, smooth apple head. Good for lots of kisses and whispered sweet nothings. Head butts – followed by a well-timed lean against your intended victim seems to make the humans be the ones really melting over helplessly. The Bambi look – for SURE the infallible method to elicit lots of ‘Oooos’ and “Aaaas” and temporary amnesia if you’ve been naughty. The so-perky-you-just-gotta-take-me-outside look – charming enthusiasm seems to be contagious even cross species. Adding a little prancing dance towards the door seals the deal! Sleepy eyes from underneath the blankey – nice one if you are trying to get your humans to stay home in bed with you. I usually combine this with sudden deafness so I don’t hear Mom saying she’s “gotta go to work.” “Got to,” ha! I’ll be the one to tell you what you “have” to do!! Tail tuck – we definitely don’t have the trademark on this move, but with our diminutive size we sooooo own the corner on the pity evoking market. The Timid-claw-reaching-out-as-if-too-weak-to-continue move – Mom seems to be powerless against this method of instructing her to continue the belly scratches. Flipping over to reveal the nice warm belly with a lot of leg action for emphasis – these squirrel-like, skinny back legs have to be good for something. 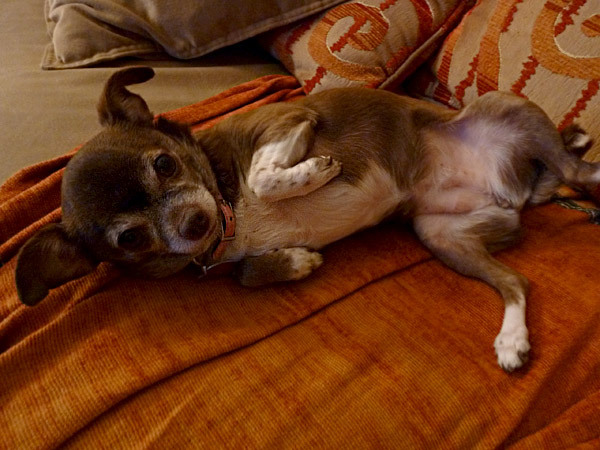 I do look a little like an overturned cucaracha when I wiggle my legs to draw attention to my belly, but a girl’s gotta do what a girl’s gotta do. The belly slide – ahhhh, the pièce de résistance or shall I say irresistance. Try dragging yourself across a rug with your cute little front paws while extending your back legs straight back AND wildly wagging your tail in excitement. On occasion I throw in uncontrollable sneezing for a special touch. Ahhh, then just roll over and watch every human in the room drop to their knees to love and adore you and your belly. 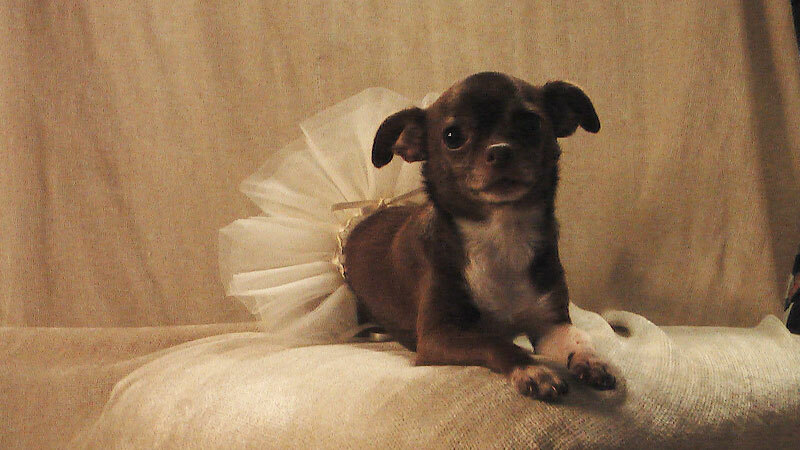 It is chihuahua love fiesta time!!!!!! There are times when I question my Mom’s sanity. Those indignant moments in my life when I just can’t figure out my human. Like the last time I went to get my nails clipped. Not only did I have to suffer the indignity of going to the groomers to get my nails clipped – just clipped mind you, no fancy pedi! But then, you did the unthinkable. You checked out the sale isle and grabbed a Snuggy!!!!!! And it wasn’t even the cute leopard print one because they didn’t have it in my petite size. But then you made me try it on, right there in the middle of the store. In front of everyone – even the dang parakeets!!! What WERE you thinking, Madre??? I know it will help keep me warm and cut down on the shivering. I know I look cute in any outfit. But how is THAT thing ever going to show off my lovely girlish figure, my delicate features, my very shiny and luxurious smooth short coat?!?! Have you lost your senses woman? I am simply traumatized. Just wait and see how I work all of this out on your pillow tonight. Can you blame me?!?!? 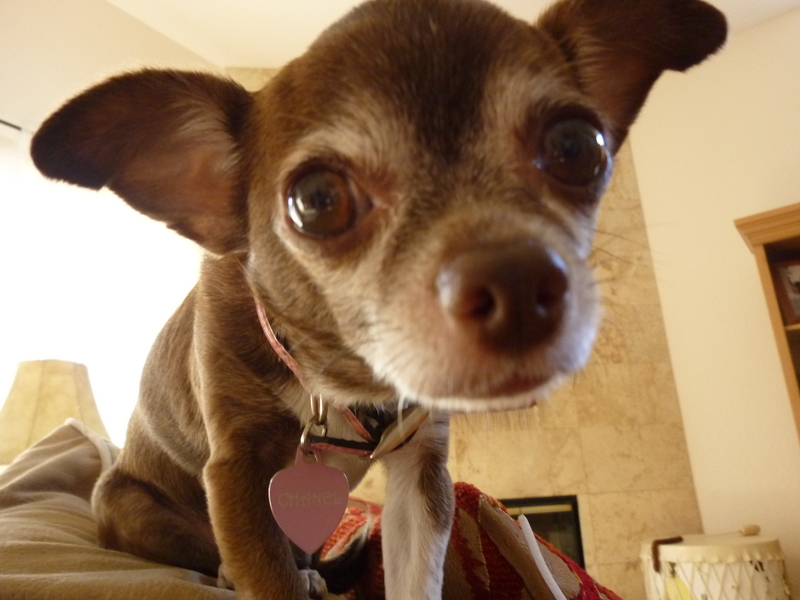 I know, you may have seen this on my new facebook page – Chanel the Chihuahua Wisdom Diva – but I gotta tell the whole world! My heart is all aflutter. Call me, my Paco!! I’ll faint if you friend me on FB!!!!!! Pant, pant. Phew, let me refocus for just a bit. What I really wanted to share is this awesome video story about my new hero, Minnie. She and her human, Craig Hook, have developed an amazing relationship we could all learn from. Great story Meredith Davenport A loving supportive coexistence can make the world go ’round. It is on Vimeo so I could not get it to embed here, but do check it out!!! Got an amazing human-animal connection to share? Let me know. As you know I am always looking for goodness to balance our universe. Much love and keeeeesses! Lea Michele and Idina Menzel, gotta say, you made my Mom and I cry. And Mr. Shue and Doogie, you just rocked. The whole show was simply awesome. 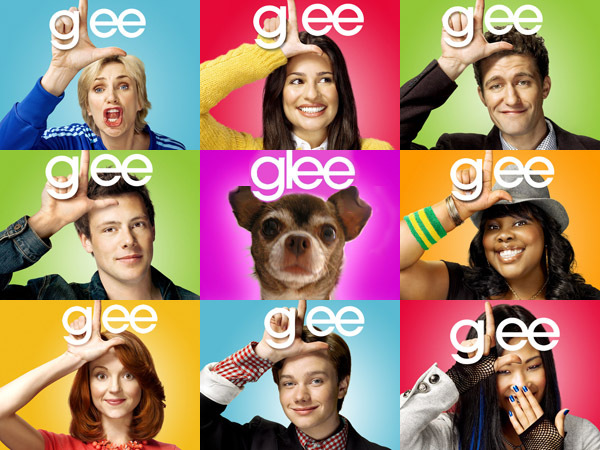 As you can see, I love Gleeeeeeeee! Well, my whole family does. And in the process, I get all my favorite laps to crowd onto the sofa for a whole hour of dedicated happy times and belly scratches. Oh, and by the way, it does not escape my notice that they mention Cheerios on the show oh so many times. And we all know how I feel about my favorite Os. As you know, I happened to share some insight just yesterday about what I normally dream about – squirrels, rice and beans, Cheerios. But after last night I have a new dream – I feel the need to sing! I can see the possibilities. I’ve always been told I am veeeeery “vocal.” Oh, and I can dance too. Put some Cheerios in front of me and there is nothing I can’t do. Besides, it would be environmentally and politically correct to add a four-legged to the cast. And bringing a little pawness to a TV comedy is not entirely unheard of. 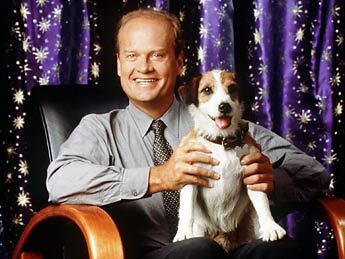 Need I mention Fraiser’s Eddie, Brian Griffin of Family Guy, or the ever patient Comet of Full House? Come on, you know I’m meant to be a star. Help me lobby Ryan Murphy and the executives of Glee to get me an audition. I could be Rachel’s alter ego. Or perhaps, I would bring out a softer more sensitive side to Sue Silvester!! OMG, I could be the Cheerios mascot!!!! It is KISMET! Showbiz, Cheerios and ME – the universe is speaking, people. It is my destiny. So having more than made my case here, only one question remains – what should I wear?!?!??!?!? 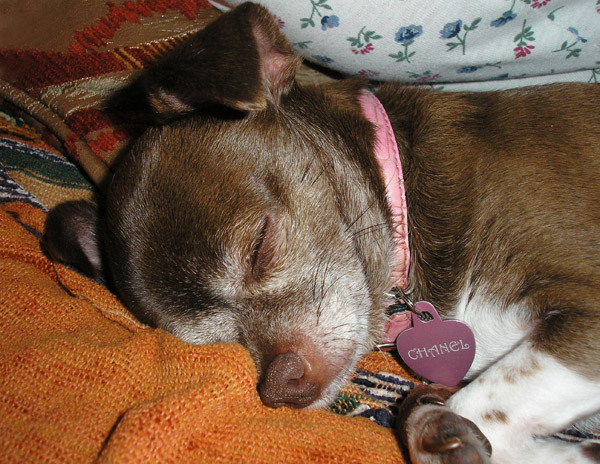 What do chihuahuas dream about? This princess dreams of princes – secret crushes that I’ll deny if I’m ever confronted. Like the Geico Gecco – it’s his eyes!!!! Caramel colored like me, big and luminous. I melt during those close ups. I know it would never work between us, but when I see him on TV I just can’t help myself. Or the Taco Bell dog. His videos on youtube, ay Papi! And there is suave and debonair Duke, of Bush’s Baked beans fame. And speaking of beans, there are the dreams about Mom’s rice, beans and picadillo. In my dreams I find myself running through fields of fluffy, yummy white rice. Leaping and chewing at the same time. I see dancing black beans, doing a rumba in my magical fiesta. Ah, and that saucy picadillo, so good it must be a sin. Deeeeeeeelectable!!! And then there are the piñatas full of cheerios … the armies of adoring fans giving me belly scratches … lots of lovely pillows piled high in a warm, sunny patch by the window … and Mommy winning the lotery so we can live the high life traipsing through Europe! Ahhh, to nap 20 hours a day IS the life!!! But eventually, my dreams end the same way – with that infernal squirrel!!! Only, in my dreams, I can suddenly climb up the tree so that beastly pest can’t get away!! Aha!!! 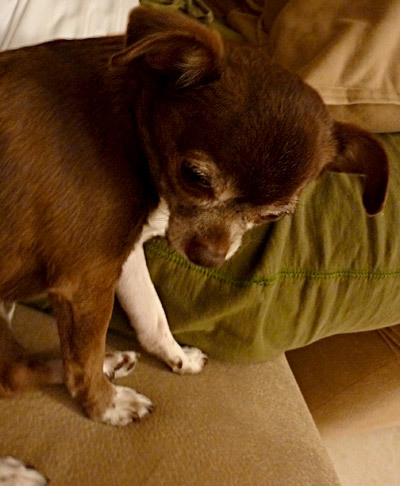 You will feel the full fury of a mighty chihuahua. No wonder I always wake up hungry! I’ve worked it out, baby. Now where are those cheerios?!?! Smiley Bebe – I dare you not to smile! Above, Mami’s pedi; at right, Mami in her pearls, perfect for any occasion; and below, it is moi, oh so pretty! 1. A pedicure – it is beach time here in sunny Florida, and Mami always said, “a chica just can’t ever be caught without a proper pedi while showing off the legs during beach season. 2. Pearls!! They are always in and go with any outfit. Actually, bling in general will always add a sparkle to my day. 3. Sunglasses, Baby! Keep up the chic AND protect the Bambi eyes. Straining and squinting against the harsh sun rays will bring on early lines around your precious peepers. No, thank you! These are my money makers. Gotta go. Feel a sudden urge to frolic through the flower beds! See?!?! It works!!!! Someone bring the snacks. 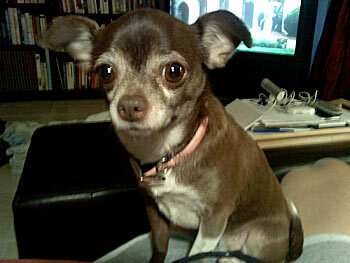 You are currently viewing the archives for May, 2010 at Chihuahua Wisdom Blog.